I gave up three books ago – just couldn’t take the difference between the first nine books and #10. Seemed to me she made a deal with the publisher and churned out pages. So was it worth staying on board? Curious reader wants to know. And I am dying to know if it’s Bill or Eric …. That’s exactly how it seemed. It lost a bit of direction in the last few books. 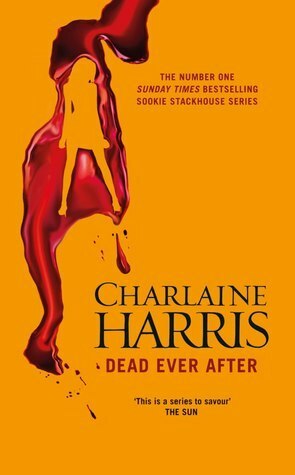 I really want to tell you who Sookie ends up with but don’t want to spoil it for others. If you look on goodreads you will find out. I really have to start reading this series. Thirteen books should keep me going for a while! yes, give it a go and then tell me if you liked how book 13 ended. Ok. So 13 books didn’t last me as long as I thought they would. It took me about three weeks to get through them and I completely agree with you about the ending. I think I scared my boyfriend last night – I was that upset and angry about the end. I suspect that the ending you were after was the same one I wanted. I wouldn’t have even cared how she got to that ending, as long as she got there. I feel like Bradley Cooper in Silver Linings Playbook when he throws the book out the window because the ending was so annoying (hoping you’ve seen that so you get what I mean). I’m so glad you read them all. And yes, I get the Silver Linings Playbook reference. Why do that to us? It takes all those books to get to where the author wants us to go – Sookie and Eric being together – and then it just peters out to nothing. I told myself after 12 that I was done. After six or seven they all started to blend together, but I kept on reading. Now that it’s over for sure, I’ll pick up 13.